Shelby Sapusek: She’s (more) Certified! Side Note: Before I go any further I need to get this off my chest. Shelby and I are business partners, but we are also friends and joke with each other. A. Lot. So, I really wanted the title of this article to be “Shelby Sapusek: She’s (more) Certifiable!” She’s also the editor on this team, so it remains to be seen if this paragraph makes the cut. Earlier this month Shelby Sapusek, a partner in this business, earned her credentials as a SGIA Certified Instructor for the Digital Color Professional program. Her final step in this process was to lead her own Color Management Boot Camp, and then have attendees review her class positively. In addition, attendees had to do well on the test. It’s not an easy bar to get over. Her journey for this certification began more than a year ago. In late 2016, SGIA made a decision to add a certification component to the already successful Color Management Boot Camp workshops they ran twice a year in their Fairfax, Va., headquarters. In March of 2017, Shelby attended the first workshop to offer the certification option. She then proceeded to pass both the test and the evaluation of a test print. This included her in the inaugural class of SGIA Certified Digital Color Professionals. 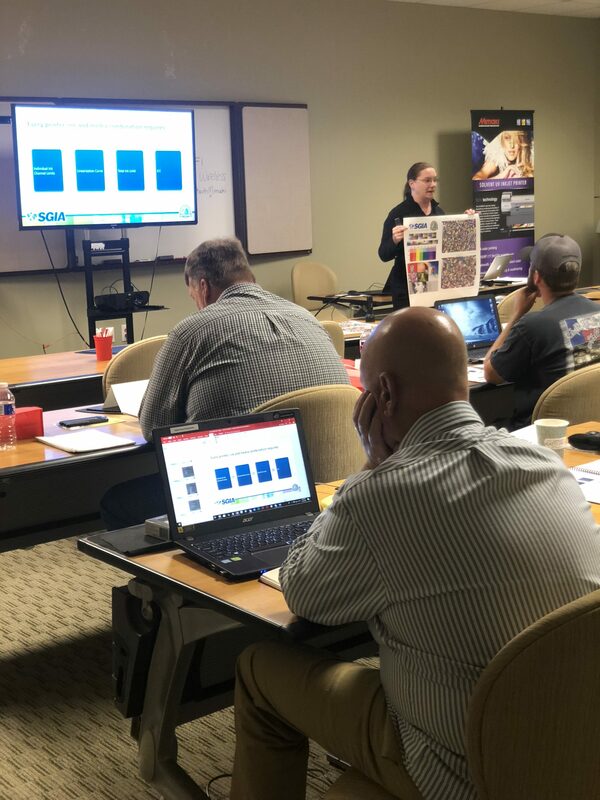 Over the past year, Shelby has helped ColorCasters organize and host several SGIA Color Management Boot Camps at various vendor locations around the country. She has been very active in the growth of this program from a twice-a-year workshop in Fairfax to what it is today. Soon more than 100 people will have been qualified or certified by the program. The instructor team has grown from four to six with one or two more to be added this year. Between SGIA and Certified Instructors, we now run more than a dozen Color Management Boot Camps a year. At ColorCasters, professional certifications are part of our business strategy. It’s not because of the status they infer, but instead because to remain certified we have to engage in ongoing education ourselves. We never rest on our laurels. We are always looking for ways to learn more so that we can be of maximum service to our clients. It’s in that spirit that I offer Shelby well-deserved and earned congratulations for this achievement. Please provide the information requested below so we can periodically send you industry updates and information regarding our new products and services.